When you’ve grown too tired of greedy mercenaries and unreliable servants, sometimes the only option is to walk down to the riverbank, gather up several hundred pounds of raw material, and magically craft your own man out of clay. It might not be the least clumsy of automatons, and yes, it might be prone to the occasional berserk rampage, but imagine what you’ll save on room and board! This classic monster of roleplaying games and mythology will be right at home in any menagerie of fantasy dragons, orcs, zombies, and creepy crawlers. 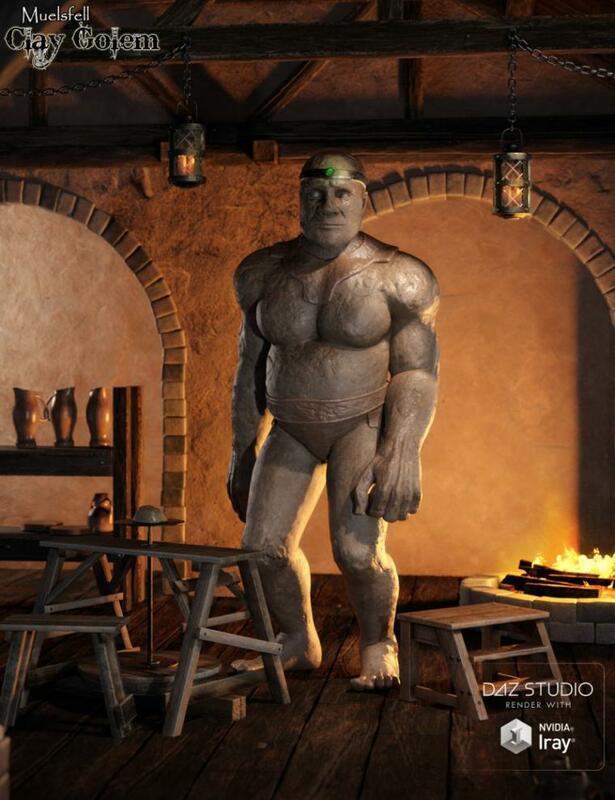 This is a full body morph for the Genesis 8 Male in both standard and high definition, and the set includes a dozen poses, four scaling options and a host of material settings ranging from soft clay to black mud to metal, as well as a three part set of basic clothing to protect your mindless creation’s modesty. A full set of Iray material presets are included. This set contains only Iray material presets, but the material textures themselves are usable in 3Delight if you wish to manually configure them.